Lily Heller's affaire de coeur with Paris has existed almost as long as her love for books. Smitten with the city's literary Golden Age of the twenties, the young bookstore clerk from Denver dreams of a life like that of bold expatriate Sylvia Beach, who founded the famed Shakespeare and Company bookshop and became her own literary legend. An impromptu trip to the City of Light carries Lily further than her imagination ever took her. Arriving unexpectedly in 1937 Paris-penniless, friendless, and clueless-Lily must rely on her wobbly French and her wits. But a mysterious invitation offers her entr e into the glittering inner circle of Sylvia Beach herself. This clue leads her further into the complex and dangerous Paris on the brink of war-and it's not the friendly literary community she had imagined. Lily becomes a character inside the world that she had fantasized about-but with chilling consequences. In her quest to return home, Lily finds herself enmeshed in an undercover league of time-traveling bibliophiles. Charged with a daunting task, along the way Lily falls for a gallant young Frenchman, discusses the art of writing with Ernest Hemingway and Gertrude Stein, and runs afoul of a dashing Nazi agent. In order to escape unscathed, Lily must make choices that force her to reconcile her past and that may revise literary history forever. 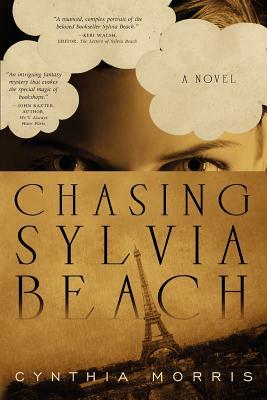 A celebration of a timeless city's allure, an engaging romantic fantasy, and a valentine to book lovers in every era, Chasing Sylvia Beach is a novel to savor and be spellbound by. "Morris captures all the excitement that a time traveler might feel if she suddenly landed in interwar Paris. Chasing Sylvia Beach compares bookselling in 1937 to bookselling now. Its modern heroine, Lily Heller, is endearing and resourceful, teaching the patron saint of independent bookstores a thing or two from the future. Morris gives us a nuanced, complex portrait of the beloved bookseller Sylvia Beach." -Keri Walsh, editor of The Letters of Sylvia Beach.